Did you suffer serious complications or side effects after having a Watchman stroke device implanted? The Food and Drug Administration recalled some Watchman Left Atrial Appendage Closure Devices made by Boston Scientific in late 2015, raising concerns about the safety of this stroke prevention device. Lawsuits may be forming against Boston Scientific, the maker of the Watchman LAA Closure Device, because of complications allegedly suffered by patients who had the device implanted. If you or someone you love was injured as a result of having the Watchman device implanted, you may be entitled to compensation. Call the experienced lawyers at National Injury Help today for a free consultation to see if you qualify for a Watchman stroke device claims lawsuit. There may be substantial cash awards from lawsuit settlements for this Boston Scientific device. Call 1-800-214-1010 at any time for a free case evaluation or use the form on the right hand side of the screen. The Watchman Left Atrial Appendage (LAA) Closure Device is a cage-like device used to prevent blood clots from traveling to the brain and causing a stroke in people with a heart condition called non-valvular atrial fibrillation, or AF. The Watchman device is meant to eventually replace long-term anticoagulation therapy in these patients. The Watchman is surgically implanted in the heart’s left atrium appendage, or LAA, a small pouch that connects and drains into the left atrium and where the majority of blood clots that cause strokes in AF patients originate. The Watchman is permanently implanted in this pouch to create a seal and prevent blood clots from traveling to the brain. The Food and Drug Administration approved the Watchman in March 2015 using an expedited review process under the agency’s Pre-Market Approval program. But merely six months after its approval, the Watchman’s manufacturer, Boston Scientific, initiated a recall of nearly 30,000 units due to potential complications during the implantation procedure. The FDA classified the September 2015 recall as a class II, meaning temporary or reversible adverse health effects were possible. The Watchman device has been linked to serious adverse health consequences, including migration of the device, fracture of the device, damage to heart valves and the potential need for additional surgeries due to complications. Individuals harmed by the Watchman LAA Closure Device may be able to seek settlements in the form of a Watchman Lawsuit. 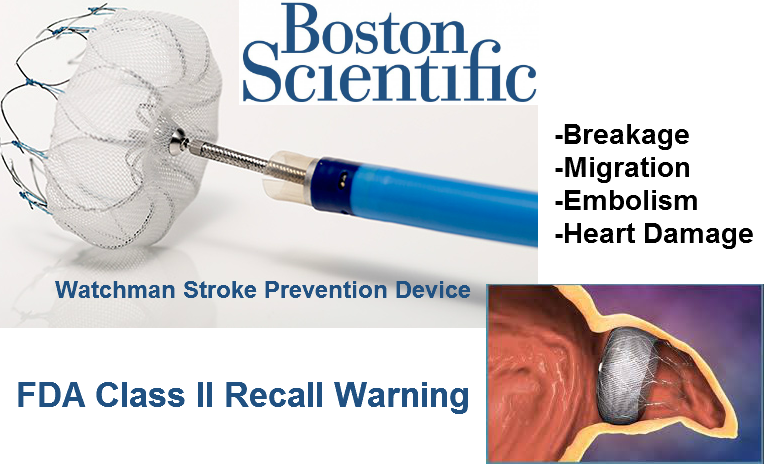 On September 15, 2015, Boston Scientific initiated a class II recall of its Watchman device and access sheath, which helps guide the Watchman into the heart. Nearly 30,000 units of the Watchman and 30,000 units of the access sheath were recalled in ­over 50 countries worldwide. The class II recall is still ongoing as of September 2016; however, Watchman devices not affected by the recall remain on the market and are still being used today. The Watchman device has only been on the market for a short time, so all of the potential adverse events associated with the device are not yet known. Some of these adverse events occur because of the device itself, while others can occur during the implantation procedure. The Watchman device is surgically implanted inside the patient, typically under general anesthesia. The procedure lasts on average about one hour and patients usually spend the next 24 hours in the hospital. Surgeons generally implant the Watchman device through a small incision in the groin area. After determining the correct size of device, surgeons use the access sheath to guide the device into the left atrial appendage in the heart where it is deployed to capture blood clots. The device is intended to remain inside a patient’s heart permanently. The cost of the Watchman device is covered by Medicare and Medicaid as of February 8, 2016. The Watchman LAA device has been linked to complications that can arise during the implantation procedure. Boston Scientific estimates the complication rate of its Watchman device is about 4%, and acknowledges there is a “learning curve” associated with implantation. This learning curve was discovered during Boston Scientific’s own clinical trials, which found a greater percentage of patients experienced “safety events” with less experienced implanting surgeons than those with more experienced surgeons. During the company’s PROTECT AF trial, 9.9% of patients experienced a safety event during the first half of the trial compared to 4.8% during the second half. Researchers established the learning curve during this trial was 5.1%. Citing numerous observational studies, the AHA said there is “moderate-strength evidence of serious harms” associated with devices like the Watchman. The study also concluded there is little evidence showing the device is “non-inferior” to long-term anticoagulation therapy – directly contradicting the results of Boston Scientific’s PREVAIL study, which found the Watchman to be “noninferior” to long-term treatment with warfarin. A study published by researchers from Belgium and Greece in the journal Catheterization & Cardiovascular Interventions in July 2015 found certain complications with the Watchman could occur not only shortly after the implantation procedure, but also later on down the line. Researchers analyzed different studies reporting cases of device embolization, or movement of the device from its original location in the heart’s LAA to other areas of the body, and found the Watchman had moved into the aorta, the left ventricle or the left atrial cavity. Movement of the device into the left ventricle was associated with a higher rate of surgical retrieval. The cases indicated most of the embolizations were acute, or occurring shortly after implantation. This may suggest complications arose because of implantation errors during the initial surgery. However, researchers also found case of late embolization. This could suggest those complications did not arise from implantation errors. Studies have linked the device to potential complications, such as movement of the device, or device embolization, and 30,000 units of the device were recalled due to “use error” in September 2015. The National Injury Help is currently investigating cases for a potential lawsuit against Boston Scientific. If you or someone you love suffered complications like device embolization after being implanted with a Watchman device, you may be entitled to financial compensation. Call National Injury Help today to speak with a member of our legal team. 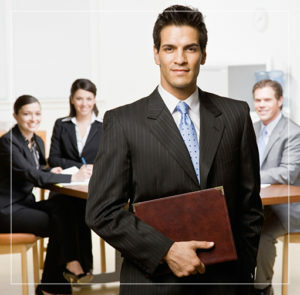 We can answer your questions and help you determine if your case qualifies for a possible Watchman Lawsuit.